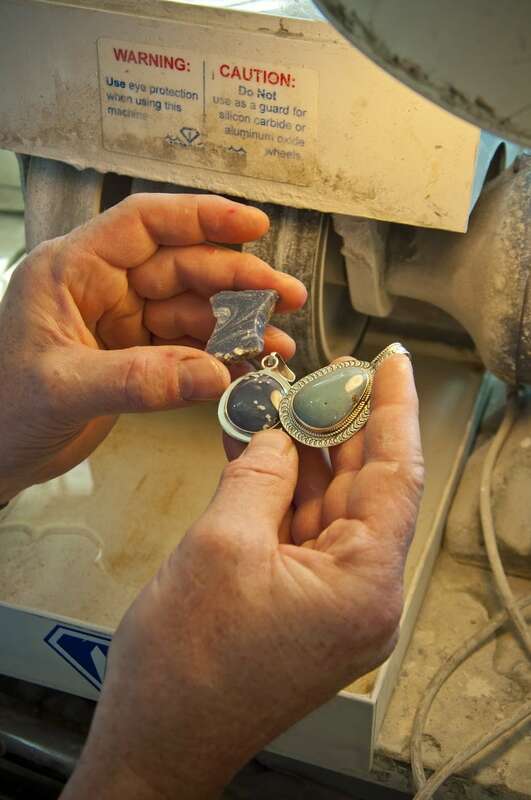 You may have seen the glassy blue stone worked into earrings or a pendant in a local store. Leland Blue, as it’s known, is popular throughout the region. Or maybe a similar stone has caught your eye in shades of green. Frankfort Green, it’s dubbed, and like Leland Blue, it appears in various shades and shapes. So, the so-called stones are actually the residue left over from making steel. Foundries across the region created steel in the likes of Cadillac, U.P. locations including Marquette and the ghost town of Fayette, and, somewhat improbably, in what are now tourist towns like Leland, Frankfort, and Elk Rapids. In an age before worries about pollution, the remnants were often dumped into nearby water, such as Lake Michigan. “There’s a lot of gray in Elk Rapids and some blue. Cadillac has green and blue,” says Gauthier, who uses the slag in his creations. He believes the differences in color were caused by the varying temperatures used to create different hardnesses of steel, as well as how much oxygen was used in the process. “A chemist said oxygen-starved fire creates bluer colors,” Gauthier says. Whatever the color, there’s no doubting the beauty of the stones. 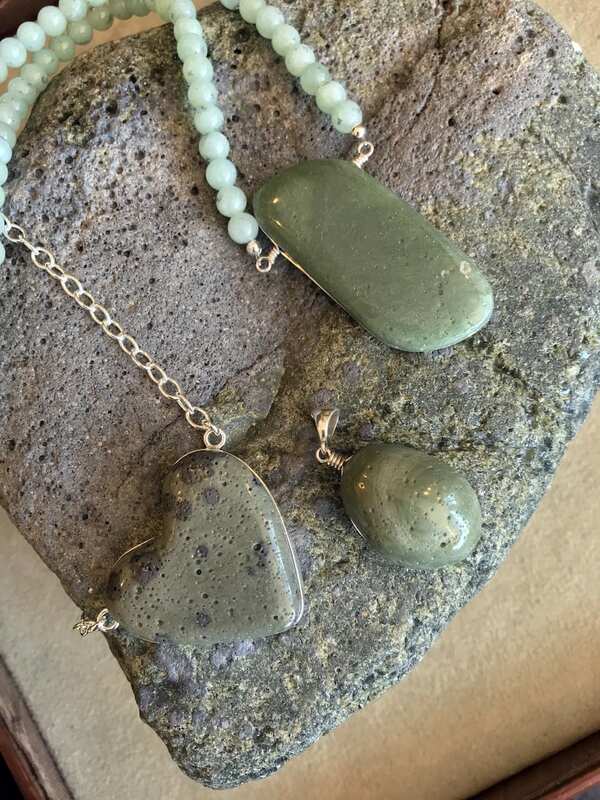 “Some are porous, others are more glass-like,” says jewelry maker Liz Saile, who sells her products from her shop in Cedar. “Every customer likes something different,” she adds. One thing she says they all have in common: “People love the story” behind the stones. Saile typically wraps the stones with wire and creates earrings or pendants. Whether the resulting piece is two-sided or one-sided depends on the stone itself. Saile creates the mountings with the stones in mind, so those that look good from both sides see both sides displayed. Others may be gorgeous on a facing side, but the reverse is less so; that lends itself to a pendant where the engaging side is the one out front. So if the colorful, glassy stones are found across the state, how did they come to be named after the tiny towns of Leland and Frankfort? Gauthier takes credit for it, saying they were first named as such in the book The Lake Michigan Rock Picker’s Guide, which he authored with Bruce Mueller. Today the stones, whatever their color, are prized by collectors. A quick Google search for Frankfort Green brings up shops from Saginaw, Port Huron, and one in Frankfort, Sunbeams of Promise. Searching for Leland Blue brings up many more responses, including more stores and a TripAdvisor review of Van’s Beach in Leland, a great place for rock hunting. There’s even a band called LeLand Blue, though it hails from Midland rather than this corner of the state. And he continues to work the stones into jewelry and sells to both the public and other jewelers. “I’ve cut stone for 40 years, everything from Michigan plus some others. Opal, black onyx, turquoise. I supply a lot of stores in Michigan. Glen Arbor, Leland, Suttons Bay, Mackinaw City, Alpena, Detroit, Petoskey, Charlevoix,” he says. In addition to his wholesale business, he operates his Traverse City store, Korner Gem, located at 13031 Fisherman Cove, right off M-22 west of Traverse City. See Korner Gem’s jewelry on ShopMyNorth!